Last few months have been a roller-coaster ride for me and I’m just praying that the New Year brings in some solace and comfort. Hopefully I will be blogging more actively and on that positive note, here I’m with the last post of the year announcing a very interesting event which I guess many would enjoy participating in.. The first event of 2014 is all about rolling out Parathas and flatbreads in an innovative way. 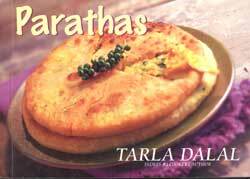 I personally love the parathas and I keep trying new variations in that especially for the kid. I find them nutritive and filling.. The event is guest hosted by Rafeeda of The Big Sweet Tooth and the winner of the event will get a cookbook sponsored by Tarla Dalal’s office. The giveaway is open for followers (publically) of my blog who can provide a valid address in India. The winner will be picked by me after the round up is posted. Wishing all of you a VERY HAPPY NEW YEAR. lovely event Pari.will try to participate IA. Happy new year Pari.. Lovely Event.. surely will participate..
Nice event.. Happy new year! !